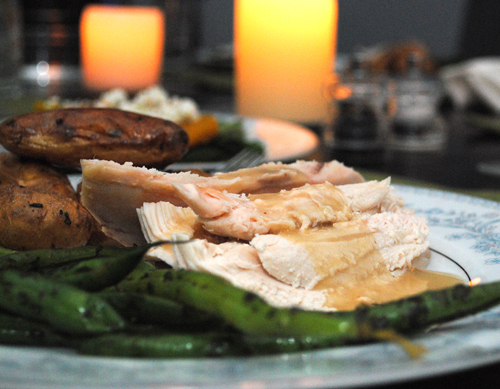 We served Roast Chicken with Giblet Gravy at a dinner party last night along with green beans and fingerling potatoes. We made Chicken Salad and Chicken Stock with the leftovers. 1 whole chicken, 3.5 to 4 lbs. Preheat the oven to 375 degrees-F. Remove giblets and set aside, to be placed in the pan with the chicken later. Rinse chicken and pat dry. Place chicken in a roasting pan. Rub canola oil over the entire chicken. Season generously with salt and pepper. Roast the chicken, breast side up, at 375 degrees-F for 30 minutes. Lower oven temperature to 325 degrees-F, add giblets to the pan (not the inside the chicken), and roast for an additional 1 hour and check temperature. Continue roasting until breast temperature reaches 160 degrees-F. While chicken roasts, roughly chop onion, unpeeled carrots, and celery, and set aside. Add mirepoix to the roasting pan when chicken has about 30 minutes remaining. Melt the butter in a small sauce pan over medium heat. Add the flour and stir continuously with a whisk. Cook until mixture is a beige color, stirring constantly. Remove from heat and set aside until chicken is done. In a separate pot, bring chicken stock to a boil, reduce heat to simmer and cover until ready to make gravy. Once chicken is done, remove to a serving platter and cover with aluminum foil. Place the roasting pan on the stove, across two burners if necessary to heat evenly. Leave giblets in the pan. Loosen the pan drippings by scraping the bottom of the pan with a spoon. Add the warmed stock and continue to scrap the bottom of the pan until all solids are loose. Bring the stock to a boil over medium-high heat. Pour stock through a strainer into a medium pot, discard solids. Place strained stock on the stove and bring to boil. Add the roux and stir continuously until thickened. Serve gravy warm in a gravy boat to accompany the chicken.